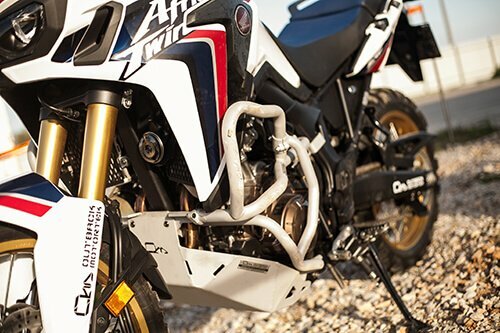 Get your Africa Twin ready for big adventures with this Ultimate Adventure combination set! 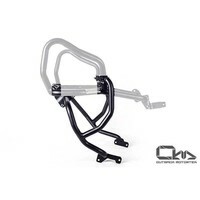 One of the biggest advantages of our crash bars system is the all around 27mm diameter tubing that rests on 5mm thick steel mounting tabs and offers reliable protection for fairing, radiator, engine case and other parts of the engine. 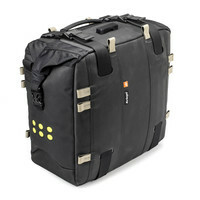 When designing these protective accessories, we had a different approach from other manufacturers. 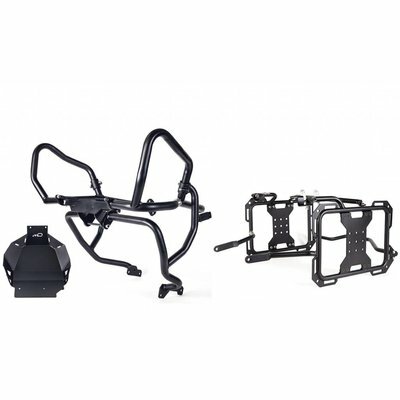 Keeping the high impact zone close to the toughest mounting points was our main goal and the result is a compact, extremely sturdy set of crash bars. Right off the bat, you can see that it’s more than just an engine guard. The 27mm diameter reinforcement bar ties the engine guard and the crash bars together, increasing the strength of the overall system. 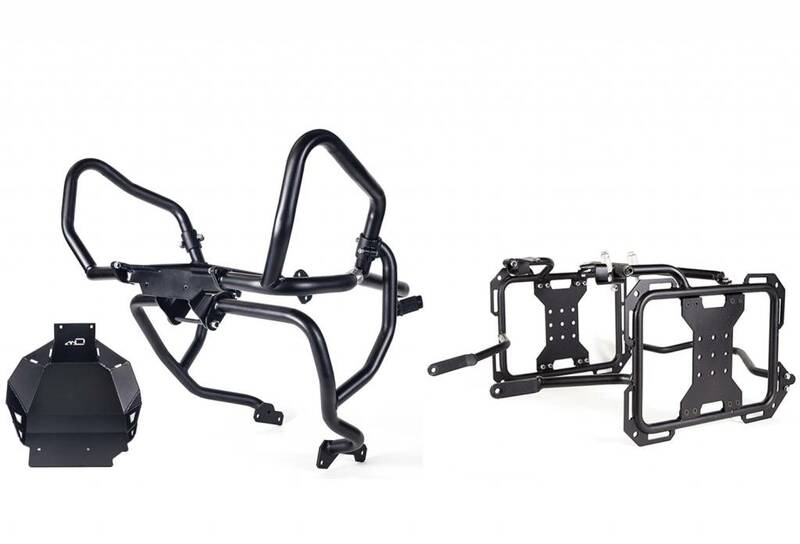 This design allows for even large impacts to be distributed throughout the entire system, minimizing damage to the bike’s engine, frame and other vital components. 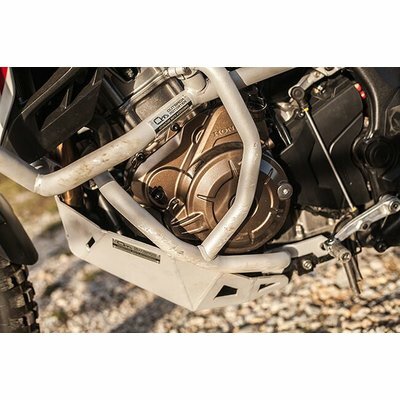 The engine guards are secured entirely onto the frame using 4 and 5mm steel tabs, knowing that the engine cases are the most exposed in all tip-overs, we designed these for maximum strength. 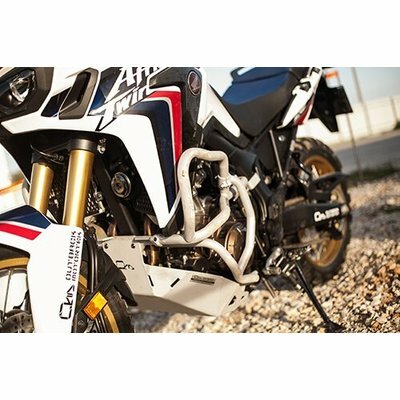 Important: changing air filter in your Africa Twin is a big job that requires plastic fairings removal. 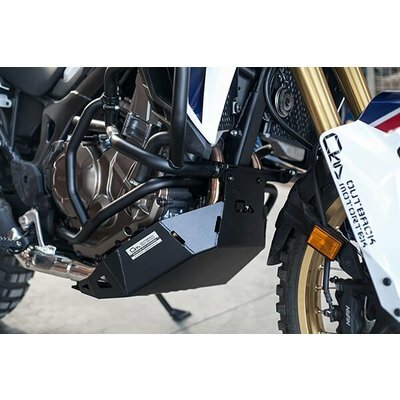 With our crash bars mounted, you can still remove or have the plastic fairings removed by your dealer’s mechanic for air filter change. 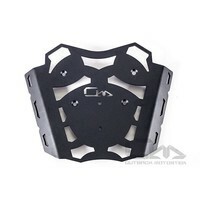 The skid plates cover the largest surface are of the engine and exhaust header and attaches to four mounting points. 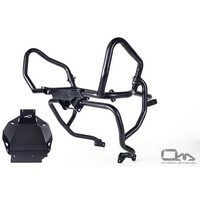 These features make the Outback Motortek stand out the crowd. 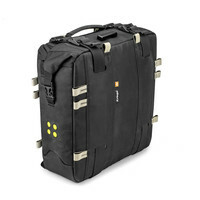 Read more about features, specs and benefits below. 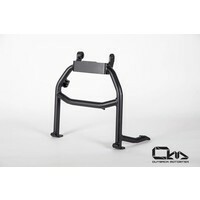 Quality 27mm/1.06″ steel tube with 2mm wall thickness – any low quality steel tubing BELOW THESE SPECS will be crushed when your 450lbs+ bike crashes into the ground. Our guards are designed to take the beat! Less is often more. We didn’t try to cover the whole entire bike with crash bars that look like a cobweb. 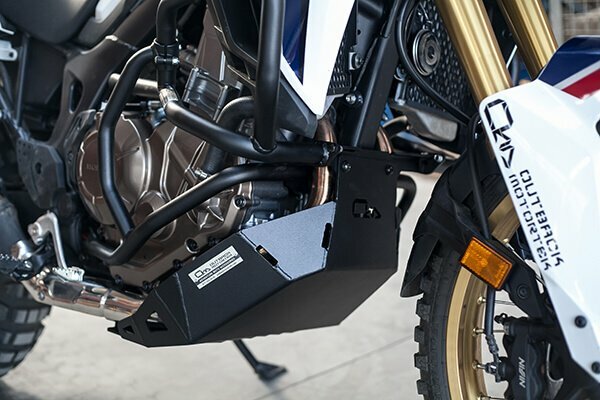 The all new Honda Africa Twin 1000 has very few tough mounting points, thus it makes more sense to create one solid and compact crash bar that stays close to the few mounting points instead of being far spread out. 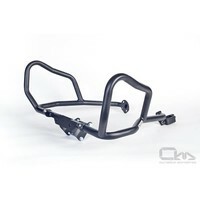 Our compact and tough crash bars are the only way to go here to truly protect your Honda’s expensive and fragile parts. Powder coated – combined with sandblasting it’s a killer combination to protect your product’s surface. 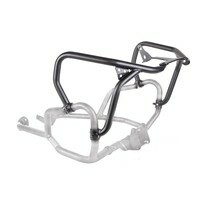 No frills and tough just like your ADV/Dual Sport bike! Protects crucial areas of the engine – oil pan, engine case, oil cooler, oil filter and exhaust header! That’s a long list of very expensive parts to expose to any sort of damage that will reduce your Africa Twins value in no time. Uniquely designed vent system – Not only unique but very-well thought out. No unnecessary holes were designed on this bash plate. As a result, your engine will less likely to overheat when mud and all sorts of debris from off-roading fly at the engine and get stuck between the skid plate and the engine/exhaust header. True off-road and adventure shape – What does that even mean?? It means we have experience in building top-notch bash plates. 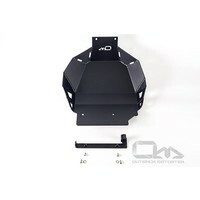 We avoid designing skid plates that are shaped like boxes, have sharp edges and corners and will guaranteed to restrict your rides off road. 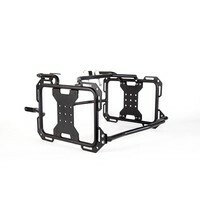 We design and build skid plates that you will only benefit from while riding on rough terrain. 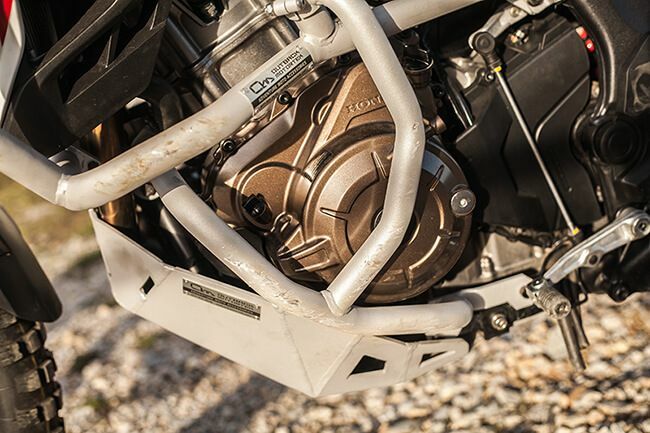 4mm thick laser cut aluminum – Nothing is ever an overkill on an adventure bike, hence we choose to build our bash plates from this ridiculously tough and thick, yet lightweight material.